Making memories as a family is essential, and creating time to get together is always worth it. Why not bring everyone to the table with a family game night? From preschoolers to high schoolers, every member in your brood can play something from this list of 35 game night ideas. There are also a few “new twist” suggestions to spark creativity and raise the fun factor. Hedbanz - This is a fun and easy game that even the youngest members of the family will enjoy. One person dons the plastic headband and puts a card in the slot without looking at it. Team members try to get their partner to figure out what person, place or thing they are wearing by answering only “yes” or “no” questions. Apples to Apples or Apples to Apples Junior - How well do you know your family members? Carefully decide which words and phrases from your cards create the best, wackiest or funniest combination to complete the phrase and win over the judge. Jenga - Purchase (or make) a life-sized Jenga game the family will love playing. Find a sturdy table to stack the hardwood blocks, then take turns slowly pulling the pieces from the bottom of the stack and carefully placing them on top of the pile. New twist: Whoever wins the game can sign or decorate a block. Shark Bite - If you have preschoolers, this should be on your family game night rotation. Players roll a die to see how many sea creatures they need to fish out of the sharks’ mouth using a fishing rod. It looks easy, but be careful. It’s only a matter of time until the shark closes its mouth and takes your loot away. Ship of Treasures - The pirate enthusiasts in your home will love this game invented by two 10-year olds! You’ll need a stellar strategy and the right treasure map to find buried booty and avoid the cannonballs. Bananagrams - We can’t decide what we love most about this game — the portable cloth banana pouch or its superfast pace! Players draw letter tiles out of the center of the table and build connecting words until one player has used all the tiles. If you aren’t into taking turns, this is the perfect choice since everyone can play at once. New twist: Play elimination and let the winners take it all the way to the final round. Minute to Win It - You only have a minute, so stop wasting time and get to it! You can purchase this game or make it your own. Ask each team to come up with five to 10 challenges it wants the other side to complete in one minute. You can stack plastic cups, arrange pennies, blow up balloons, solve a Rubik’s cube, etc. Compete against other players or race against the clock. Genius Tip: Use these 50 minute to win it games for inspiration. Chopped - Calling all chefs! It’s time for some culinary competition. Using only what you have in your kitchen, select four ingredients the other team or an individual must use to make a signature dish in just 30 minutes. Judges can award points for presentation, taste and creativity to determine the winner. Jeopardy - The game where the question is the answer is always a popular game night option. For best results, have only a few categories and use an online game creation program, PowerPoint or index cards for the board. Each team should come up with categories and the corresponding answers (or questions). 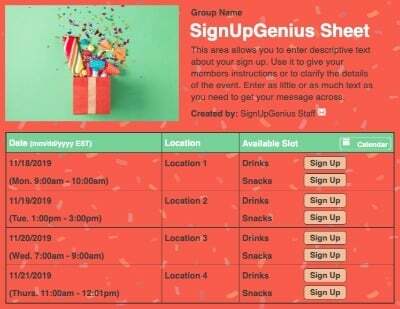 Give contestants an easy way to “ring in.” Use noisemakers or ask contestants to shout their name for a shot at the answer — which is actually the question. Family Feud - With the top answers on the board, find out who can predict what the survey says. Do some research and create interesting lists with four or five ranked answers (most popular carnival food, top places for summer vacations, favorite car colors, etc.). 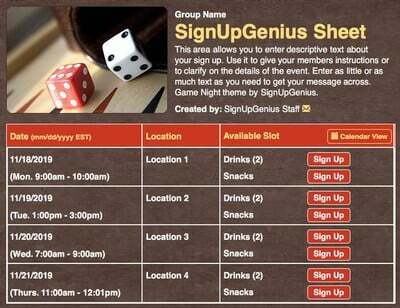 Take turns and have each player see how many answers they can guess correctly or play in teams. Monopoly - Carefully choose your game piece then take turns traveling around the board, collecting $200, buying property, making deals and staying out of jail. New twist: Ask younger players to use construction paper and markers to design a homemade currency for the game. Clue - A classic whodunit is always an excellent choice for game night. Players must pay close attention to the clues to figure out who committed the crime, in which room and using what instrument. New twist: Have each family member dress like a “Clue” character and play up the part. Pictionary - This game draws out the best in everyone! Team up, then grab a marker and channel your inner Picasso to get your partner to guess the answer. You can purchase the game or make it a true original by creating your own categories. New twist: At the end of the game, play a bonus round where those drawing have to use their non-dominant hand to try to get their teammates to guess the answer. Bingo – Even the youngest players will be happy to join a game of Bingo! You can use numbers, letters, words or pictures to create the Bingo board. New twist: Ask each family member to come up with a theme for a Bingo round such as favorite vacations, TV shows, “Who said it?” and other creative categories. Homemade Mad Libs - Take family night to a whole new level with homemade Mad Libs. Each family member writes a story, leaving blanks that other family members will complete. Take turns writing in wacky nouns, verbs, exclamations and other parts of speech for a zany story. This can be a non-competitive game, or you can vote for the best Mad Lib! New twist: Use pictures from past vacations, holidays, etc. to stir up inspiration for a good fill-in-the-blank story. Three Truths and a Lie - Can you spot the lie? Put everyone’s name in a hat to see who goes first. Allow a few moments for contestants to think and come up with a game plan (the perfect time to grab the popcorn and snacks)! Listen carefully to the four statements, then write down which statement you think is the lie. New twist: Come up with themes or questions to get the game started. Indoor Bowling - This is an inexpensive way to enjoy an evening of bowling, minus the shoe rental and stylish shirts. Line up plastic cups (the more, the merrier) and roll a plastic whiffle ball (or dodgeball or any other ball that won’t cause too much indoor damage) toward the “pins.” Rotate who is scoring, bowling and resetting the pins. New twist: If you don’t have a plastic ball, take a look in the freezer. Bags of frozen veggies slide beautifully across a kitchen floor (just don’t plan to eat them later). Obstacle Course - Get the family moving by creating an indoor or outdoor obstacle course. You can compete in teams or time each player. Obstacles can include climbing over a tower of pillows, crawling through a blanket tunnel, taking five trips around the swing set or doing 15 pushups by the mailbox. The more creative, the better. Twister - How twisted can you get and still stay on your feet? Gather the family around and spin the wheel to see who can perform the ultimate balancing act. If you have a large number of players, consider using two boards or make one yourself. Corn Hole - Play a game of “bags” and find out who has the best throwing style and strategy. New twist: Block off areas of the board and assign various point values. Use masking or painting tape so you can easily remove it from the boards when finished. This makes it easier for young players to score more points, even if they can’t get the bag in the hole! Charades - One word, sounds like? Get animated and try to get your partner to guess the movie, TV show, personality or place you are acting out before time is up! You can purchase game cards or ask participants to come up with titles of some of their favorite shows. New twist: Divide topics into easy, medium and challenging categories so all family members can play along. Scavenger Hunt - The classic go-find-it game to play indoors, outdoors or anywhere you are ready to fire up the competition factor! Players can search for hidden items around the house, in the neighborhood or at a favorite vacation destination. New twist: Have teams or individuals snap a picture when they find the hidden object and send it back to the group. Silly Bat, Run the Bases - See how well your family handles gravity after putting their heads on top of a bat and spinning around. Use dice to determine how many spins the player will spin before running the bases, sprinting around the house or performing a simple task. Hide and Seek - It sounds elementary but finding new and creative places to hide in your home takes a lot of skill. This is a good option for the preschool set and could lead to tired kiddos! Make it more interesting by using a timer to see who can find the other team (or object) in the shortest amount of time. Gin Rummy - In many families, learning how to play Gin Rummy is more than a game, it’s a tradition. Players take turns drawing from the pile or working from the discards, and build a winning hand with three or four of a kind (i.e., four 2s, three 7s) or a suit run (3, 4, 5 and 6 of hearts, for example). This game can be played with two or four players. Kings on the Corner - This game is easy for kids six and up to play. The deck is placed in the middle and four cards dealt on each side. The first player to get rid of all his cards using the black/red pattern working from highest card to lowest is crowned the winner. Watch for King face cards: they can be played on the corner and open up the possibilities for victory. 99 - This is an excellent card game for helping kids with addition and subtraction. Each player gets four cards. Players take turns putting one card in the center pile and drawing another. Cards are added up based on face value, but don’t be the one caught going over 99! Look for these helpful cards: 4s reverse the playing order, 3s hold the last number played, 10s bring the number back down 10 points and 9s take the score to an automatic 99. Spoons - Break out the cutlery and see who can think fast! To determine the number of spoons placed in the center of the table, take the number of players and subtract one. The dealer gives four cards to each player then chooses a card off the deck and moves one card facedown to the player to his left and so on. When a player has four of kind, they take a spoon from the center of the circle. The player left without a spoon loses the game. Make it a Priority - Family time is valuable but actually getting to the game table can be challenging. Pick a date and get everyone excited with a digital or paper invitation. Set the Rules Before Game Night - Games can bring out the best (and sometimes the worst) in players. Come up with three to five rules all family members agree on. Keep the rules on display during game night and be sure younger kids know the consequences for not taking turns or being a bad sport. Let Everyone Participate - Depending on how long your game night is, plan to play one or two games. This keeps the evening from becoming dull and gives a chance for players with different skills to excel. Don’t Forget the Snacks - What goes best with family game night? Food! Have something ready to go or order in from a delivery service. Stopping to eat dinner or having a snack is a great way to transition to the next game or event. Award Prizes - Hit your local discount or dollar store and get fun prizes for the winners (and losers). Make sure everyone ends the night with a prize! Think Ahead - Challenge family members to come up with their own game for the next family night. With these tips and game night ideas, you’ll be sure to have a fun and competitive time. That makes everyone a winner! 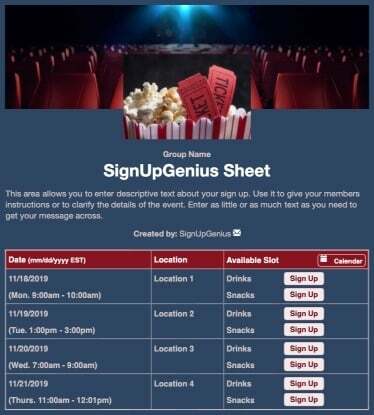 Use an online sign up to plan a home movie night.